On the surface, the town of Wendover doesn’t appear to be a place with much of a past. The reality, however, is that the community has a rich history, which is revealed in a recent book by Ronald R. Bateman. Called “Wendover: Winds of Change,” the book is a comprehensive study of the people and events that helped to build Wendover into a successful resort community on the Nevada –Utah border. Bateman, who grew up in Western Utah, begins the book with a complete timeline of significant historical events involving the region. In pre-historic times, the area was actually beneath Lake Bonneville, a large inland sea that covered western Utah and Eastern Nevada. The first non-Indian visitor was most likely frontiersman Jedediah Smith, who, in 1827, is believed to have crossed the nearby salt flats while returning from an expedition to California. A few years later, in 1833, fur trapper Zenas Leonard journeyed through the area and wrote that he had seen a tall mountain (10,715-feet) covered with snow (now known as Pilot Peak Mountain), which he said was striking because it appeared to be unconnected to any other mountain range. Later, many emigrant wagon parties camped in the area during their journey to Oregon and California. Pilot Peak, which has natural springs at its base, served as a guide for those traveling across the barren salt flats. Bateman traces the beginnings of Wendover to a later time, the early 20th century, when the Western Pacific Railroad was constructed through the West. Starting in about 1907, the railroad established the town, complete with a roundhouse, depot, water tower and other services. The first train to reach Wendover arrived in 1909. Wendover puttered along for the next few decades, mostly catering to railroad traffic and, after completion of the Victory/Lincoln Highway, motorists. In 1914, a man named Teddy Tezlaff drove a Blitzen Benz automobile as fast as he could on the nearby Bonneville Salt Flats, becoming the first person to attempt to establish a land-speed record (his unofficial time was 141.73 miles per hour). In 1932, Smith and Eckstein added a roulette table, becoming the first gaming establishment in Wendover. Bateman notes that the Second World War was the next significant event in the town’s history. In 1940-41, the Wendover Bombing and Gunnery range was opened and over the next few years grew substantially larger as additional companies of troops were sent to the region for training. In 1944, Wendover was selected to be the training ground for the 509th Composite Group, a top-secret contingent of troops that prepared for an atomic bomb mission to Japan. On August 6, 1945, the group’s commander, Colonel Paul Tibbets Jr. piloted the Enola Gay, which dropped an atomic bomb on Hiroshima, Japan, which effectively ended the war. An impressive stone and bronze monument has been erected adjacent to the Wendover Visitors Center to commemorate the men who worked on this project and as a monument to world peace. Additionally, the hills around Wendover have been painted with graphitti, much of which was painted during World War II by airmen and soldiers. In some cases, you can still read the numerical insignias of the various troop companies. More recently, Bateman points out, Wendover has grown as a result of thrill-seekers and tourists. The Bonneville Salt Flats, located a few miles from Wendover, has hosted a number of land speed record attempts over the years. The book includes an extensive section on the various speed record efforts including those by driver Mickey Thompson (in the "Challenger I") and Craig Breedlove (in "The Spirit of America"). 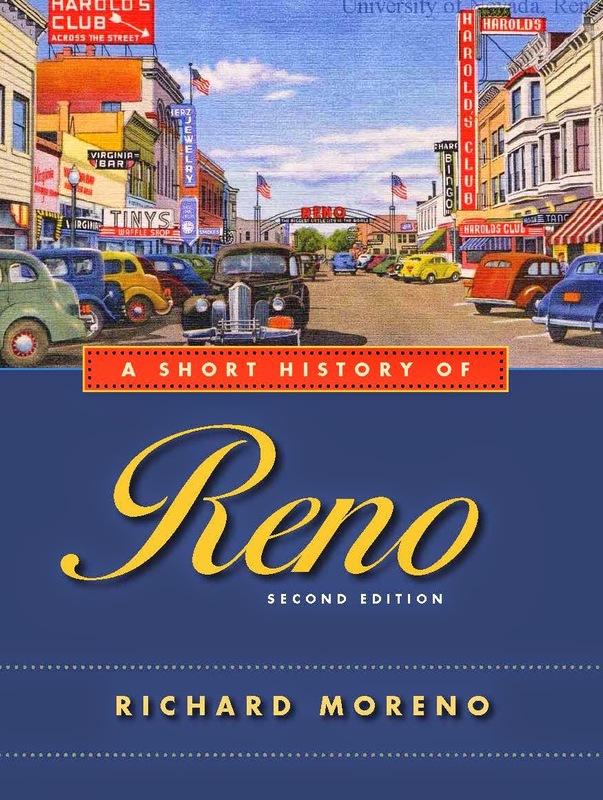 Bateman also writes about the development of Wendover’s resort industry, which began in the 1980s with the construction of several hotel-casinos. Within a few years, a half-dozen large resorts had been built and the town had evolved from sleepy last-stop-before-you-leave-Nevada into a popular gaming destination for travelers on Interstate 80. 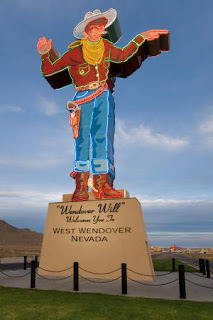 One of Wendover’s most recognizable landmarks is Wendover Will, a 64-foot-tall, neon cowboy sign erected adjacent to the Stateline Casino in 1952. In 2005, the big buckaroo was renovated and moved to a new location near the Wendover Visitors Center to serve as the community’s official goodwill ambassador. In addition to the hotels, Wendover still has a handful of landmarks that recall its time as an important airbase during World War II. Southeast of the main section of the town is the Wendover airbase. You can still find some of the old hangers that housed the airplanes of the 509th Composite Group during the war. In recent years, the buildings have appeared in several motion pictures including the 1996 science fiction thriller “Independence Day." “Wendover Winds of Change: A Story,” is self-published by Ronald R. Bateman and available through various gift shops in Wendover and from the Utah Salt Flats Racing Association, P.O. Box 27365, Salt Lake City, UT, 84127-0365, e-mail: sales@saltflats.com, 801-485-2662. The mining camp of Jumbo never quite lived up to its name. Optimistic prospectors hoped it would produce enormous wealth but it proved to be a pretty small producer of gold and silver ore. In fact, these days, the real riches found on the road to the former camp are in the marvelous views of the surrounding region. The site of Jumbo is located two miles east of East Lake Blvd., above New Washoe City, via a rugged dirt road marked Jumbo Grade. Jumbo was founded on the Ophir Grade between Washoe Valley and Virginia City in about 1907. 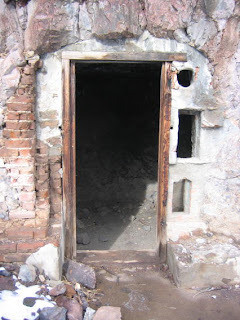 For a few years, a small community of miners managed to eke out a living working the area's mines. By 1908, the camp boasted a mill, saloons, hotels, shops and a post office, although the latter was closed in November 1910, indicating the transient nature of the community. In 1915, miners continued to work the area and a ten-stamp mill was built near the settlement. By 1921, however, any valuable ore had run out and Jumbo disappeared like so many other Nevada mining camps. While Jumbo has an admittedly brief life, the drive or hike to the former mining community is worthwhile because of the views. Jumbo Grade Road, also known as Ophir Grade, rises above Washoe Valley and climbs deep into the Virginia Range before dropping into Virginia City. During our recent hike along the grade, we found that the first half-mile is paved, as the road passes several newer houses. We came upon a dirt parking area that serves as the trailhead for hikers, bikers, ATVers and others heading up the grade. After ditching our car, we began the trek uphill on a dirt road that parallels Jumbo Creek. About a mile and a half from the start of the road, the dirt track crisscrosses the creek, which is lined with thick vegetation. At about the two-mile point, the road becomes rockier and, at one spot, we were forced to cross the creek, which has carved a fairly deep channel. We continued on the trail, stopping to pick up interesting rocks and to admire the creek, which has a fair amount of water this year. About another half-mile or so we spotted mining tailing piles on the surrounding hillsides. A bit farther, you can spot the large foundations of a mill site. Two large chalky-gray hunks of concrete and scattered pieces of metal and wood are just about all that remain of the Jumbo mines. From here, the views, looking west to Washoe Valley, are spectacular. Slide Mountain stands high, directly across the valley, and you can catch glimpses of the sun dancing on the surface of Washoe Lake. At the four-mile point, the road completes its climb over the Virginia range. Here, you can look both west to Washoe Valley or east to the Dayton Valley. To the north is a smaller valley tucked into the mountain range. The road winds around the summit and, about a half-mile ahead, you can see the ruins of the mining camp of American Flat, just below. All of the views are beautiful and make the somewhat difficult journey worthwhile. At the six and a half-mile point, you can see the community of Gold Hill below, with the taller buildings of Virginia City peeking over the mountains to the north. From there, the road skirts a large open pit mine that has long been abandoned before gradually descending to meet Nevada Route 341 at the Virginia City-Gold Hill boundary. While the total mileage has been only eight miles, it seems a world away. The desert has not been kind to Rhyolite. Once impressive concrete, stone and brick buildings have been blasted by wind and sand into skeletal reminders of a place that was once one of Nevada's most promising mining towns. Sitting on the edge of Nevada, overlooking Death Valley, Rhyolite—perhaps more than any other ghost town—tells the story of the rise and fall of a Nevada mining town. Rhyolite is located about four miles west of Beatty, via State Route 374 and U.S. Highway 95. Gold was discovered here in about 1904 and a township was mapped during the following year. By May, 1905, the town had its own newspaper, showing that it had come of age. A month later, a post office was opened and by 1907, an estimated 6,000 people had flocked to this boomtown in the desert. Soon, no less than three railroads (the Las Vegas and Tonopah, Tonopah and Tidewater and Bullfrog-Goldfield) were built to serve the town, which also had 45 saloons, an opera house, a telephone company, electric power plant, three ice plants, several hotels and two stock exchanges. Rhyolite, however, turned out to be a disappointment in terms of gold production. While there was gold, it wasn't in sufficient quantities and accessible enough to justify the development that had appeared almost overnight. Another problem was the 1906 San Francisco earthquake. Many of Rhyolite's investors lived in San Francisco and, following the earthquake, were more interested in rebuilding their lives than spending money on a questionable investment in Nevada. The final blow was a national financial panic in 1907. As a result, the money began to dry up for developing Rhyolite's mines and people began to move on to more profitable places. The census of 1910 indicated 675 residents and a decade later the number was fourteen. 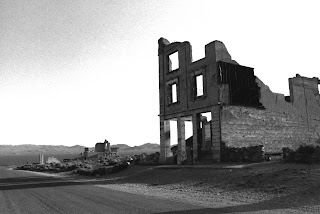 Today, Rhyolite remains one of the most photogenic of Nevada's ghost towns. In the late afternoon, the sun stretches the shadows of the ruins, creating marvelous images. The town contains some intriguing structures, including the three-story exterior walls of the J.S. Cook Bank, the facade of the Porter Brothers store and the interesting remains of the town’s two-story school. The former Las Vegas and Tonopah Railroad depot is one of the finest examples of the early 20th century mission-style architecture used for many public buildings. Rhyolite is also home of one of the last mostly-intact bottle houses in the state. The unusual structure was constructed in 1907 using 15,000 bottles at a time when conventional building materials were scarce. An excellent web site on Rhyolite is www.rhyolitesite.com, which is managed by the Rhyolite Preservation Society, a group dedicated to saving the community. However, the east edge of town, adjacent to Dayton State Park, is a lesser-known historic site that helps tell the story of Dayton. Nestled in a grove of graceful cottonwoods is the Rock Point Mill, one of Dayton's oldest remnants of its mining glory days. At the peak of the Comstock mining boom, the mill was enlarged to include 56 stamps and more than $170,000 in modern equipment. The mill was one of three important ore processing plants located in Dayton and was instrumental in the development of the Comstock mining district. In 1909, the Rock Point Mill was destroyed in a fire, but its owners immediately rebuilt it using galvanized iron. The second mill remained in use until about 1920 when it was closed for good and dismantled. Today, a small wooden sign at the site offers a few details about the history of the mill. Many of the ruins date to the second mill built on the site, including the cement foundations. Others, such as the stone walls, date from the original mill, which was one of the first to process ore from the fabulous Comstock Lode. Old photographs (such as those found in Stanley Paher's book, "Nevada Ghost Towns and Mining Camps," which can be obtained at nearly any bookstore in the state) reveal the size and scope of the Rock Point facility. Photos exist that show the fire of 1909. 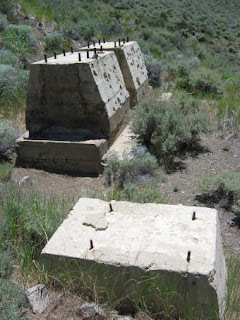 The Rock Point Mill site is located about 12 miles east of Carson City, just north of the Dayton State Park, on the north side of Highway 50. There is a poorly marked dirt road on your left (coming from Carson City) just beyond the mill site. The site can be accessed from the state park via a concrete tunnel that goes under U.S. 50. Visitors can wander the ruins on a series of marked trails. At the top of the hill overlooking the ruins is a large, round concrete structure that was once part of the mill complex. From there, you can get a marvelous view of the Dayton Valley. At the base of the mill you can find a small rock hole (it looks like a cave) cut into the rock wall. Portions of a wooden wall and door frame the hole, which goes back about five feet. West of the mill foundations, which are quite extensive, is a small grove of mature cottonwoods—which are particularly colorful in the fall—and the remnants of a small earthen and concrete dam, which once must have captured water for use at the mill. Dayton State Park is a picturesque spot located on the banks of the Carson River. It has tall, shady cottonwoods, developed picnic areas and a campground with 10 sites for tents or self-contained RVs (up to 20 feet). Additionally, it offers drinking water, RV dump station, flush toilets, and picnic areas. It is open all year. For park information: 775-687-5678.